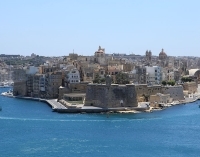 Malta's main maritime towns have merged into a fortified conglomerate known as the Three Cities, resting on the promontories opposite Valletta. Vittoriosa is the oldest town in Malta after Mdina, featuring plenty of historical architecture, including several of the Inns of the Knights of St John. There is also a hospital built by the Order in 1672, in which still lives a Benedictine convent of devout nuns. Dating from 1274, Fort St Angelo is the oldest fortified part of Vittoriosa and stands at the tip of the promontory. Additionally, the Museum of Maritime History is well worth a visit. Founded in 1717, Cospicua is the youngest of the Three Cities and features some fascinating churches. Senglea, designed by Grand Master De La Sengle in 1551, exists as an important pilgrimage destination. Its parish church contains a statue of Christ the Redeemer, said to have miraculous powers. There are many great restaurants and bars in the Three Cities and the marina area is becoming increasingly popular. The best way to explore is on a walking tour, wandering through the old districts and discovering unexpected joys and treasures. Apart from the rich history, the Three Cities are famous for their residents' enthusiastic celebration of holy days and festas. The most exciting of these is the Easter procession, when status of Jesus Christ are carried at a run through crowded strets.